Things started out well. Two interesting narratives, one in the “present,” the other flashbacks to explain how the present came to be. A core set of interesting characters, all three of them easy to root for. A very interesting idea about humanity’s first contact with alien life. It didn’t all go wrong, it just all went on too long. Even at just over 300 pages. Which is my major issue with a large slice of contemporary science fiction and fantasy. Too often every little detail, every baby step of the plot, every piece of dialogue no matter how inconsequential is included. 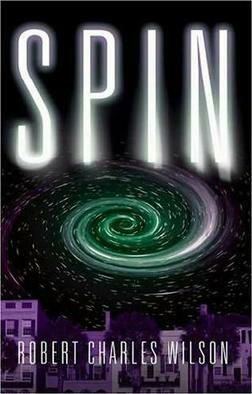 Spin, like so many other novels, is easily twice as long as it needs to be, maybe three times. But this seems to be what fans of the genre want. Look at how popular Game of Thrones novels are–100’s of pages that could be summarized in a single, economic novella. But, God is in the details, fans might argue. So is the devil, I’d reply. In Robert Charles Wilson’s novel Spin the people of Earth find their planet has been encased in what they come to call a membrane. The membrane keeps out all light but the sun, turning the night sky completely dark. Through testimony from returning astronauts locked outside the membrane when it first appears, scientists are able to figure out that time is passing much more slowly inside the membrane on earth than it is outside in space. Every second on earth equals 3.17 years outside the membrane. Which means the sun will expand and die in a single human lifetime turning the earth into an uninhabitable scorched planet. Who has done this? Why would they do it? I found this idea very interesting. As end approaches, society begins to fall apart which did remind me of The Last Policeman series, but that was fine. I enjoyed The Last Policeman books, each also just over 300 pages for the record. I enjoyed most of Spin, too. But eventually I grew weary of all that dialogue, all that plot, all that stuff that just didn’t seem necessary. I ended up skimming the last 100 or so pages but still got all the details I needed to appreciate how it all turned out. Next Next post: Tournament of Short Stories, Science Fiction Edition: “Lot” by Ward Moore vs. “Break! Break! Break!” and “Rock Manning Can’t Hear You” by Charlie Jane Anders.